« Can I Make it to Calgary? Last year I visited Shannon Sookochoff at Victoria School. She showed me a neat activity on simplifying radicals on a Geoboard. As I was thinking about how to introduce adding and subtracting radicals recently, that activity came back to me. I have created an extension of what Shannon Showed me. 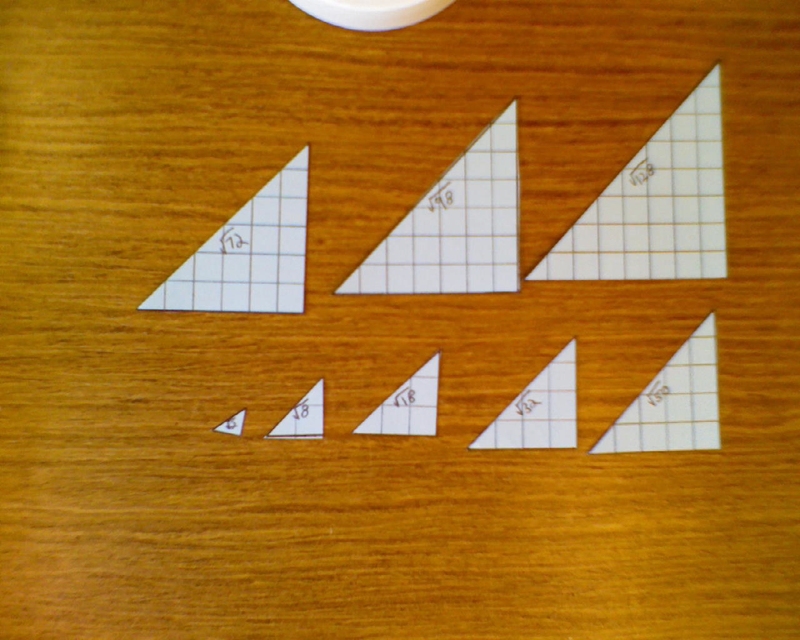 Have students create “sets” of triangles. The set I would start with is the set. 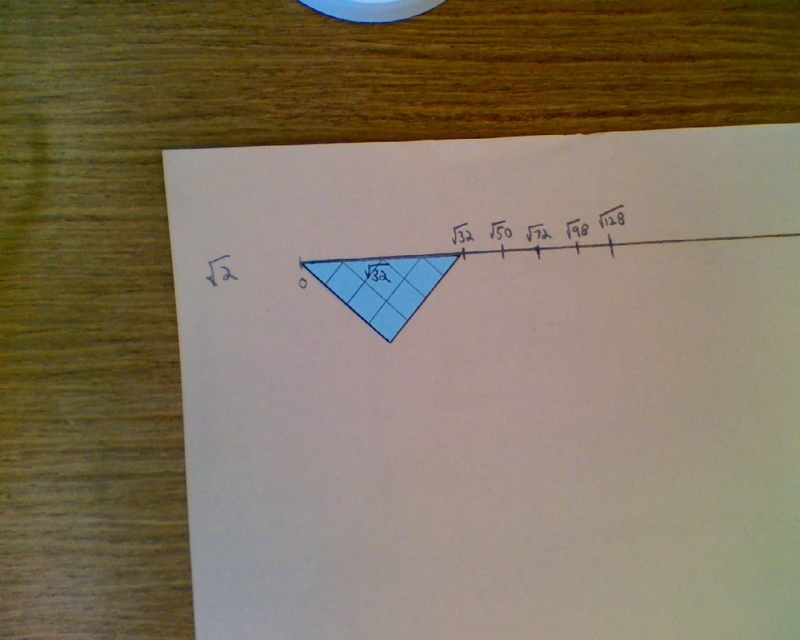 Use a 1 cm grid on a piece of colored card stock. Have students draw right triangles with legs 1 and 1 (makes the hypotenuse ) and then with legs 2 and 2 (makes the hypotenuse ) and so on. 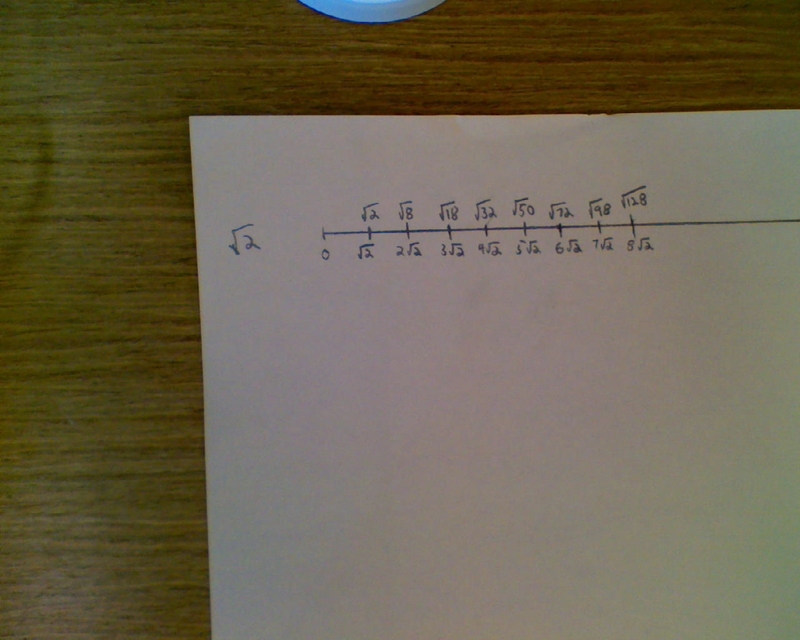 Continue all the way to one with legs 8 and 8 (makes the hypotenuse ) . Next, draw a line on a piece of paper. 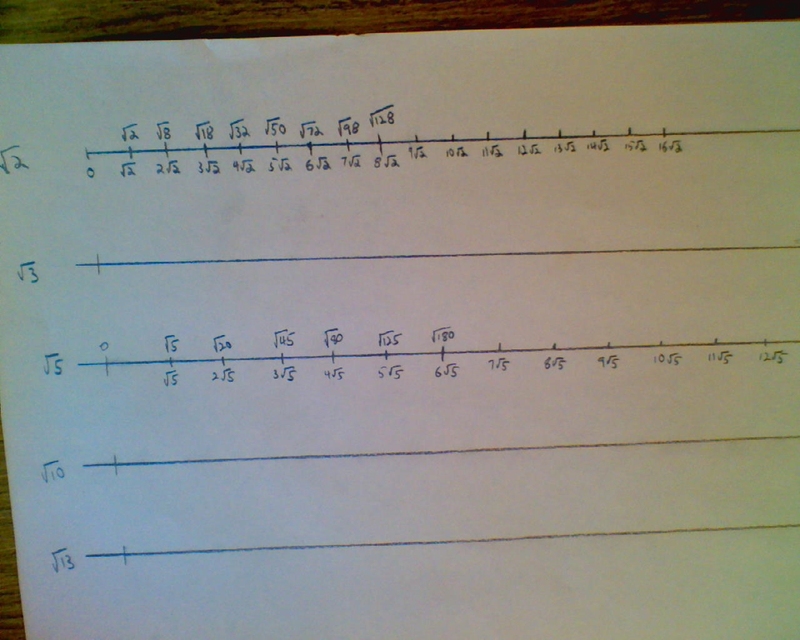 This will be our number line. 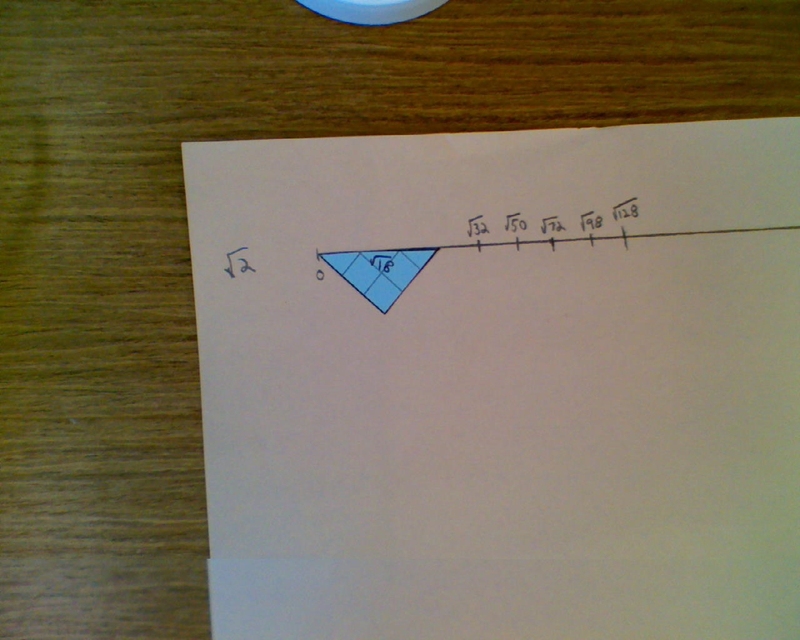 Start by putting the triangle on the number line, and marking this point as . Work your way in by putting the next one, which is , on the line. Continue until you get down to the . At this point, students should notice that all the gaps are in length. This will allow them to label the bottom of the number line with , , , and so on. Notice that this gives a nice visual showing entire radicals and their equivalent simplified mixed radical. Now we will extend the number line. 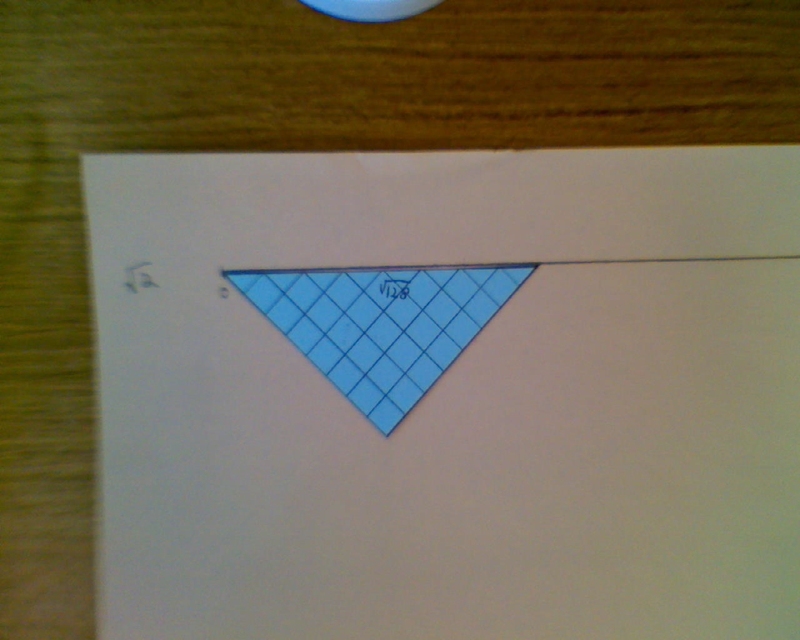 The quickest way to do this is to use the triangle and place it on as shown. 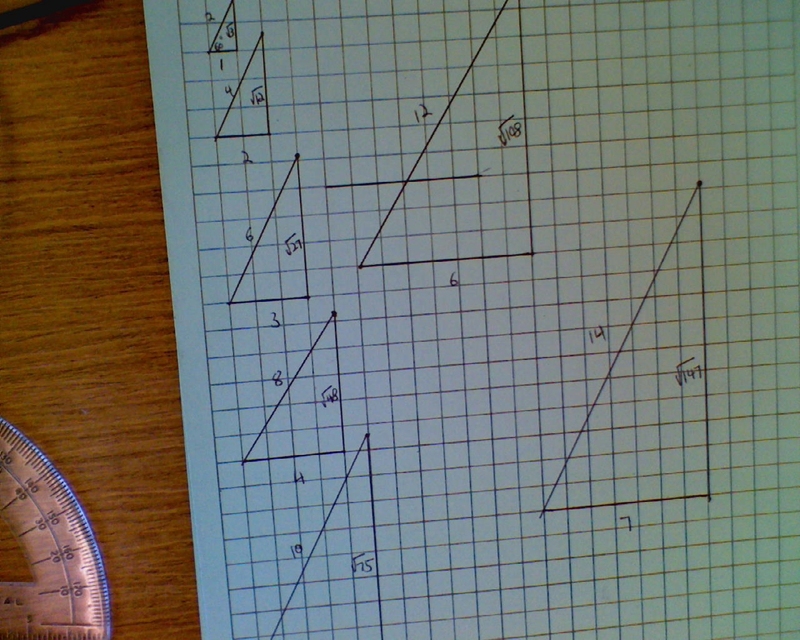 Then just mark the intersections along the hypotenuse. These are each long, so we can extend our number line. I took mine to . 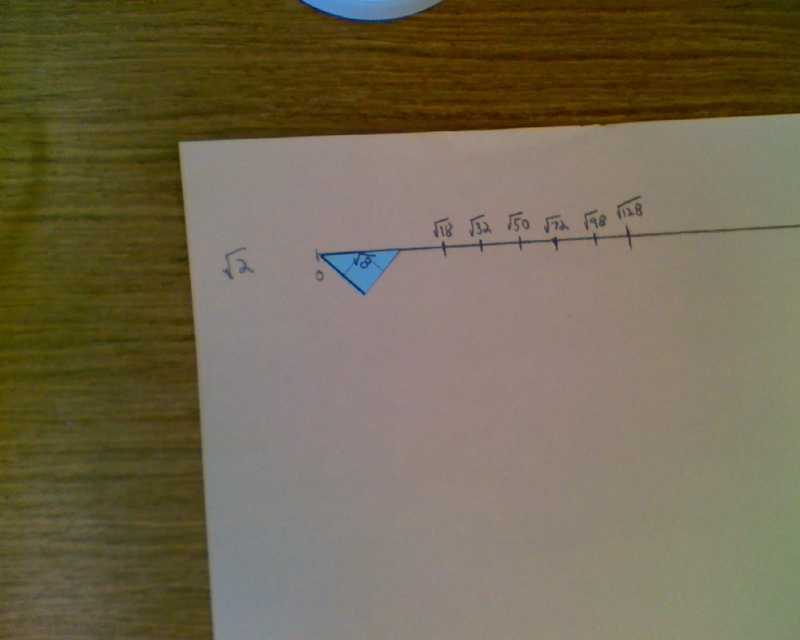 Now we can add radicals pictorially on our number line. For example, if we wanted to calculate , just put the two triangles on the number line as illustrated, and read the mixed radical below. Now you can have the students make other sets. The easiest to make are ones that don’t require any angle measurements. I would make a set in a different color, by using legs 1 and 2 cm long, and then just extending those by multiples of the original sides (your other legs are 2 and 4, 3 and 6, 4 and 8, 5 and 10, 6 and 12). Cut them out, and add them to a second number line below the first. 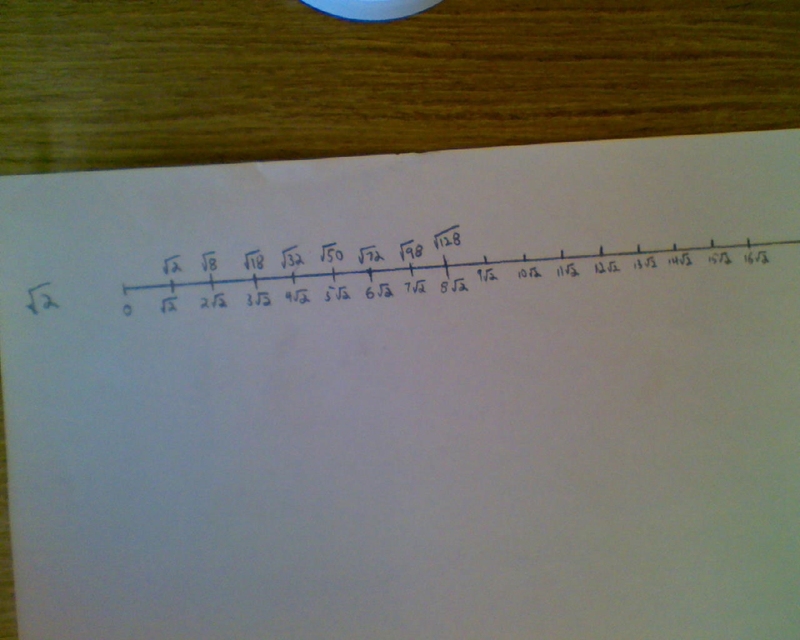 Line up the 0’s, so that students could compare and order mixed radicals using these number lines. Other sets that are easy to make are (Legs 1 and 3, and then multiples of those), (Legs 2 and 3 and then multiples of those), and (Legs 1 and 4 and then multiples of those). You could make as many of these as you want. It would be nice to have a set, too, but this one will require some angle measurement. 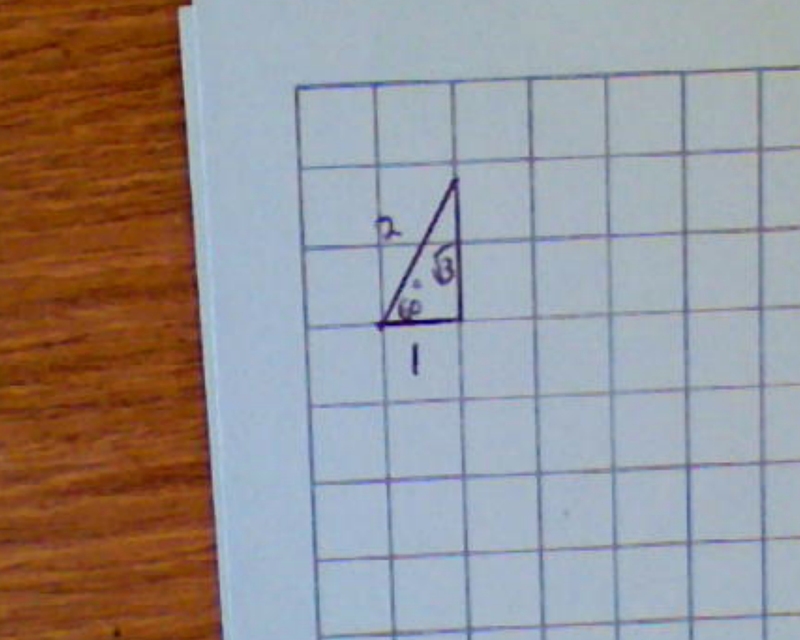 Start with a base of 1, then measure an angle of 60 degrees. Where this meets the vertical will be a height of . 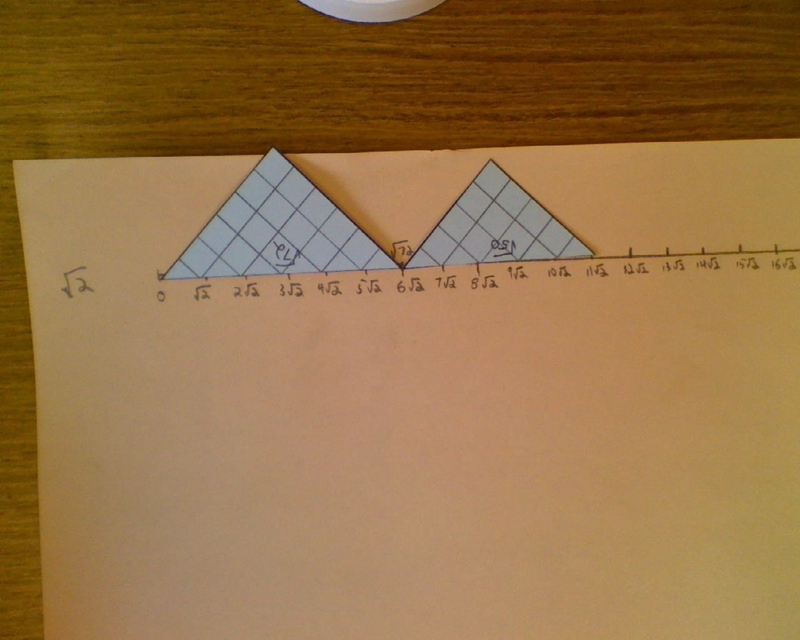 Cut out this set, and add it to your number line. Note that this set is much harder to build accurately. 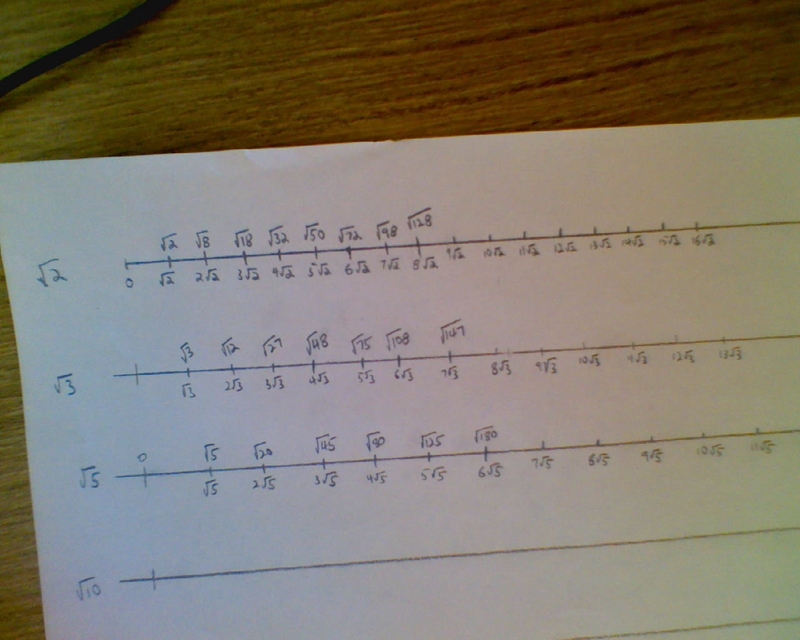 I measured as carefully as I could, and my gaps are not consistent. Edit: I have made improvements to the creation of the a set based on feedback from the comments section below. You can see a better way to make the a set here. Now that you’ve built these radical rulers, here are a few things you can do with them. Simplifying radicals. This is a quick pictorial representation of what radicals become in simplified form. Comparing and ordering radicals. Which is greater: or ? Typically, students would punch this in a calculator and compare decimals. It works, but has no understanding behind it. With their radical rulers, they can see which is bigger. Adding and subtracting radicals. 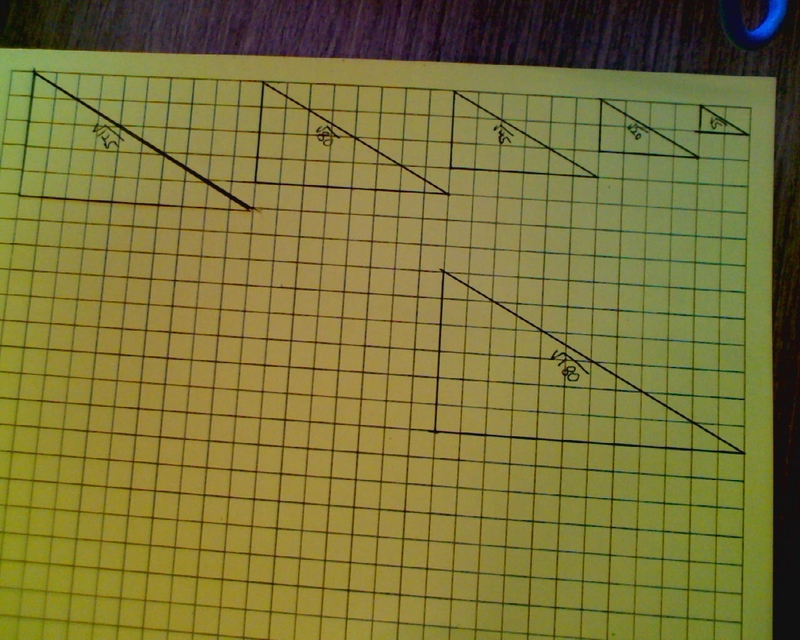 Put the triangles on the number line as shown above. To illustrate adding only like radicals, ask them to add and . They will discover that it can’t be done. , in green, is not like , which is yellow. I’d love some feedback on this one. 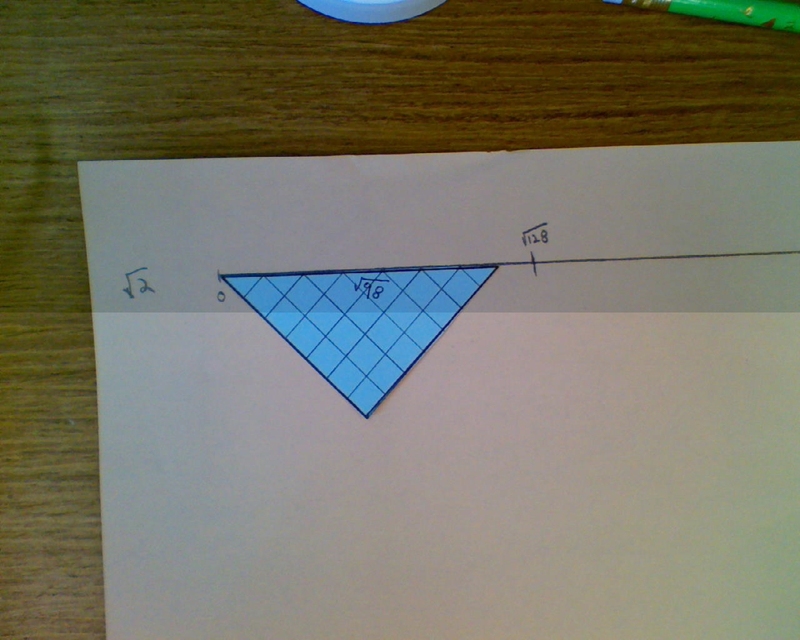 It’s not something I have ever tried in a classroom, but I would love it if someone tries it, and lets me know how it worked. 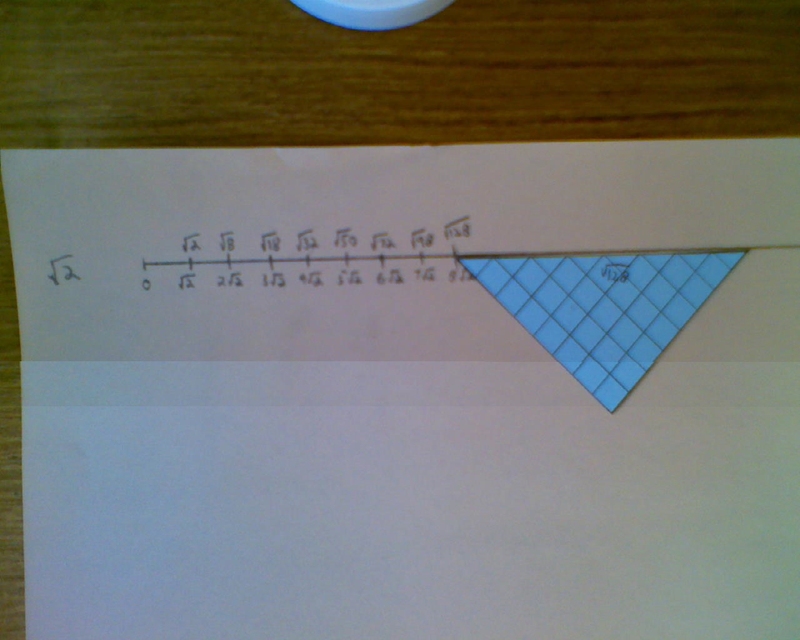 My immediate thought re the root 3 ruler is that you could use isometric dot paper to build that one without any angle measuring. You’d have to account for making the units match up with the units from your square grid paper though, and I haven’t thought through that lil’ issue yet. Two people coming up with better ways to make the root 3’s than I thought of. I love it. Keep it coming. Two ways to make the square root of 3 without measuring the angle. 1. 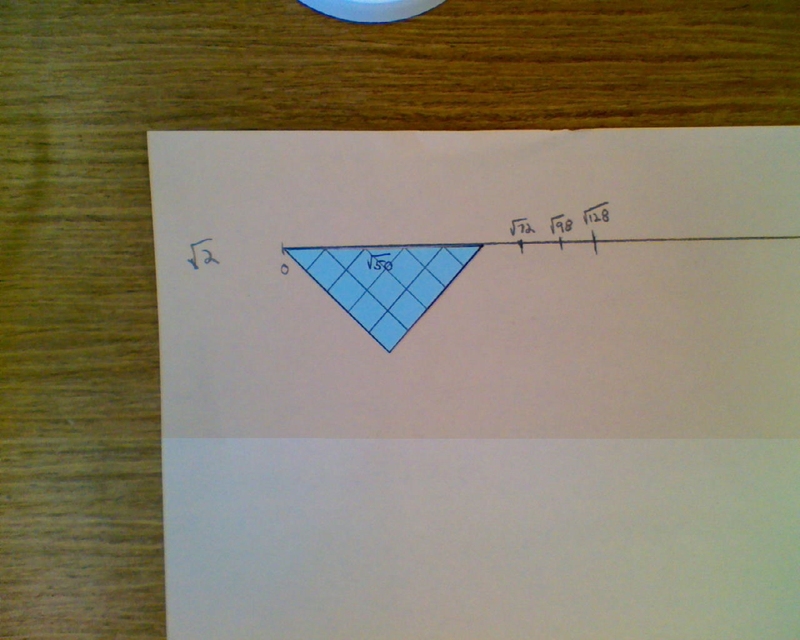 Make a base that’s 2 units, construct a perpendicular bisector, draw the equilateral triangle, cut it in half. 2. 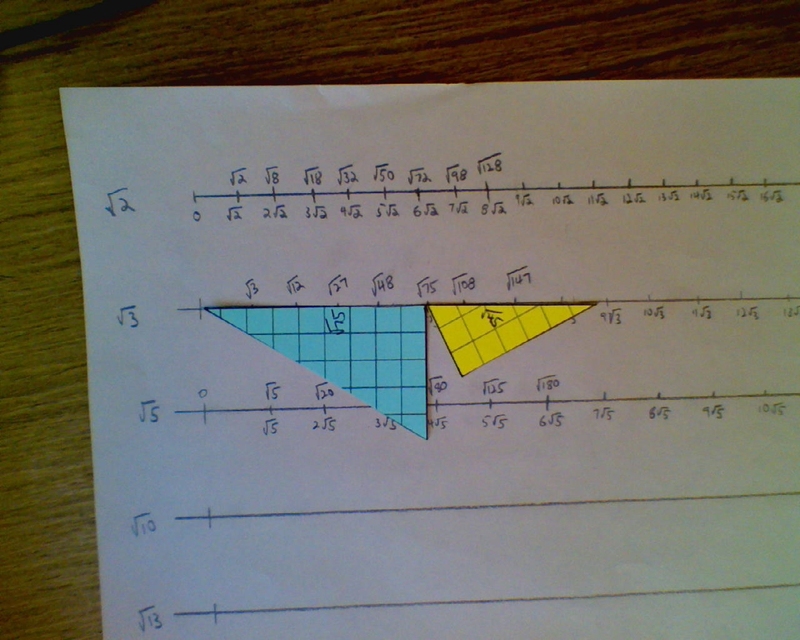 Make your square root 2 triangle, now use its hypotenuse as a leg for a new triangle (you might want to put graph paper on top, with the lines lined up along that hypotenuse). If the other leg is one unit, then the new hypotenuse will be square root 3. Are these too complicated to use? Not too complicated at all. They’re really nice. I can’t believe I didn’t think of the first one, considering I always get root 3 in class from an equilateral triangle of side length 2. 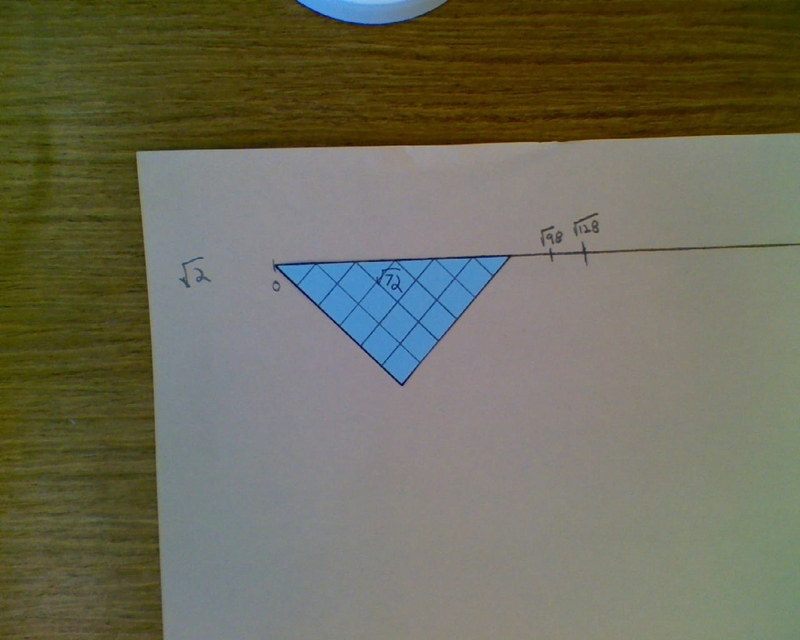 It would be really easy to bisect a side of 2, and then measure another 2 units using that grid paper. Actually, the second way I mentioned is cooler, because you can extend it to get any square root you want. I bet you’ve seen the diagram (whose name escapes me). Make a third triangle off the hypotenuse of the second and you get sqrt 4 (which you didn’t need), and a 4th off that for sqrt 5, etc. I find things by googling, but if all I have in my head is an image, what then? And it’s also called Spiral of Theodorus. Maria pointed me to the wikipedia article. What a great visual way to teach radical arithmetic! Excellent job. I particularly like your use of different colors for different radicand sets, so students can see they can not be added without some conversion, to say decimals. There is a simpler way to create radicals whose radicands are of different base. You can use the Spiral of Theodorus. After you create the radicand-2 set, you can create the radicand-3 set by using the hypotenuses of the radicand-2 triangles as legs for larger right triangles and 1 (or radicand-1 if you prefer) for the other leg. For instance, (sqrt-3)^2 = (sqrt-2)^2 + 1^2 and (sqrt-6)^2 = (sqrt-5)^2 + 1^2 but != (2sqrt-3)^2 + 2^2 (as some students might erroneously try). a Geogebra construct of Lichtenberg ratios, yet another (very advanced) way to create radicals. a Math Lab in which students explore radicals in another context. I can’t believe I didn’t think of a spiral, particularly since one of my favorite radicals lessons has kids construct their own. The one slight fear I have about using a spiral, is that a small error in measurement at the front is magnified at the end, which can be a problem when two kids compare number lines, and their markings are in very different places. I’ll post that other lesson when I get a chance, and explain what I mean. I wouldn’t worry, John. (I think I googled it, too, about a week ago, when another math person used it.) I think it’s a brit thing. You rock, Scamdog!!! I am so please that you ran with this idea. 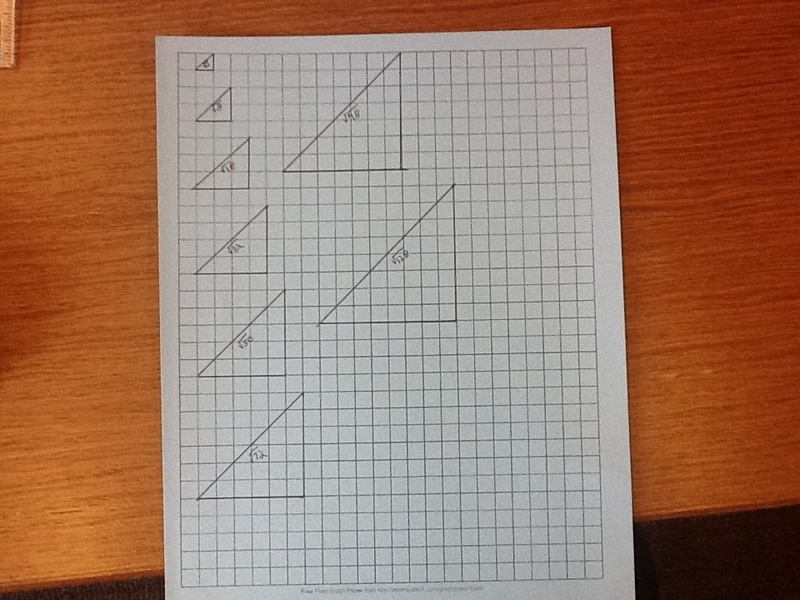 Yes, I have thought about your idea of the ruler and have seen it used in fraction work. Well done! Hi there colleagues, its great post regarding teachingand entirely defined, keep it up all the time.